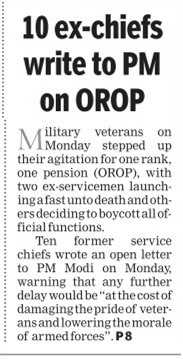 Ten former Chiefs of the Indian armed forces today wrote to Prime Minister Narendra Modi demanding immediate implementation of the ‘One Rank, One Pension’ (OROP). 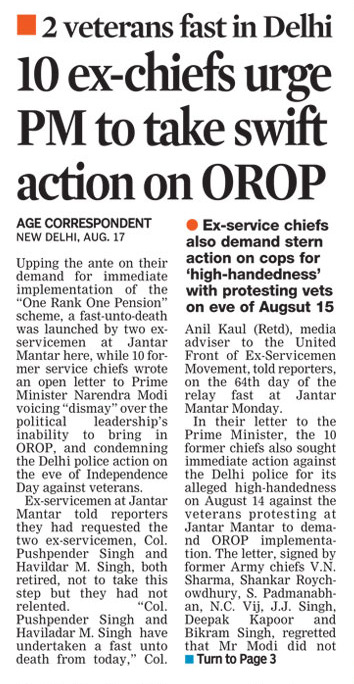 They also sought action against the policemen who allegedly manhandled protesting ex-servicemen at Jantar Mantar on August 14. 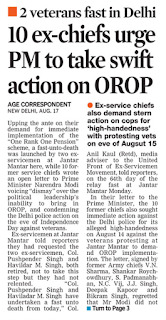 An ugly clash had erupted, a day before Independence Day, when policemen tried to evict protesting retired soldiers from Jantar Mantar, citing security reasons. 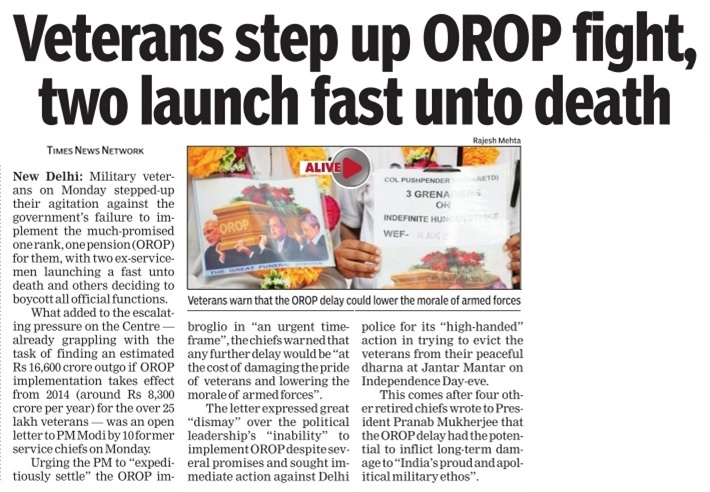 Pictures of the clash were beamed on various news channels, after which the Home Ministry gave permission to the ex-servicemen to continue their protest. The former Chiefs in their letter to the PM stated, “We stand steadfastly by the side of our colleagues and fully support their just cause. Our silence so far was due to the need to observe propriety. 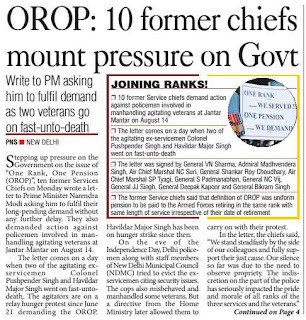 The indiscretion on the part of the police has seriously impacted the pride and morale of all ranks of the three services and the veterans.” The Chiefs said they were “dismayed” at the inability of the political leadership to clinch the issue of the OROP for the forces. 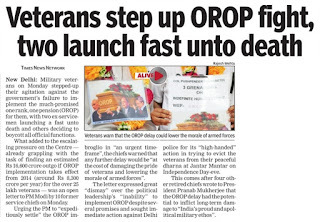 The signatories to the letter are General VN Sharma (retd), Admiral Madhvendera Singh (retd), Air Chief Marshal NC Suri (retd), General Shankar Roy Choudhary (retd), Air Chief Marshal SP Tyagi (retd), General S Padmanabhan (retd), General NC Vij (retd), General JJ Singh (retd), General Deepak Kapoor (retd) and General Bikram Singh (retd). 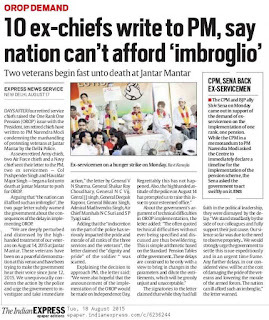 They said the nation couldn’t afford such an imbroglio, “let it be known that we (the signatories) have extreme concern for the veterans’ long-pending demands”. 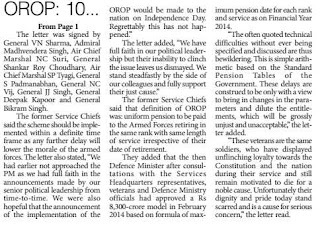 The ex-Chiefs said they had expected an announcement of the implementation of the OROP on Independence Day. “Regrettably this has not happened”, the letter said adding “the often quoted technical difficulties without ever being specified and discussed are, thus, bewildering”. 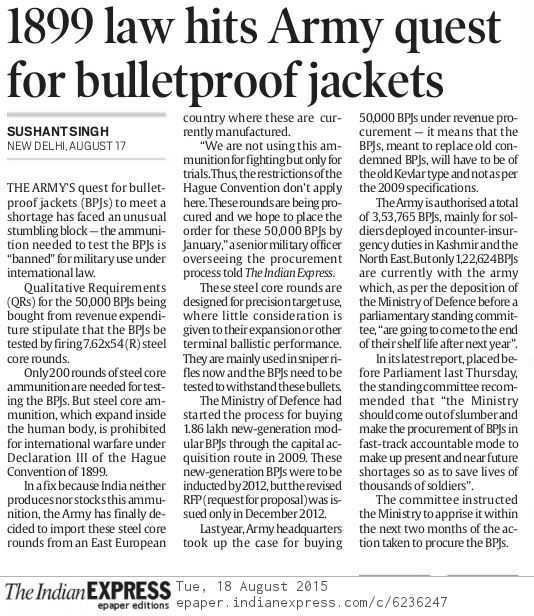 Doubting the long-drawn discussions, they said “These delays are construed to be only with a view to bring in changes in the parameters and dilute the entitlements, which will be grossly unjust and unacceptable”. 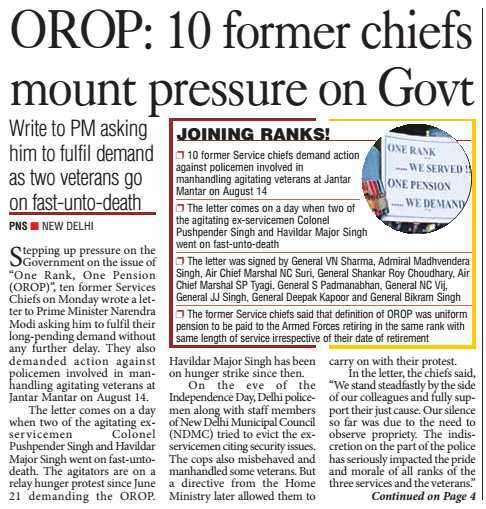 Meanwhile, two veterans, Col Pushpender Singh (retd) from the Grenadiers regiment and Havildar Major Singh (retd) of the Sikh Light Infantry, have started a fast-unto-death, demanding OROP. 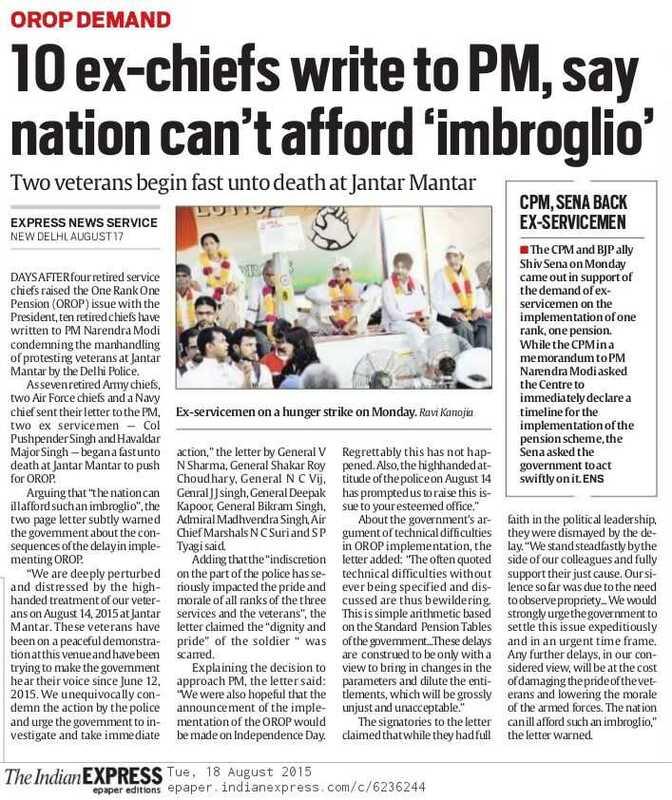 Notably, the ex-Chiefs’ letter came four days after four other retired service Chiefs wrote a letter to President Pranab Mukerjee seeking his intervention in the issue. 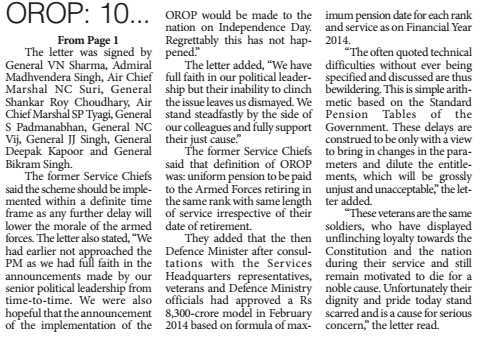 The letter was signed by General SF Rodrigues (retd) and Admirals L Ramdas (retd), Arun Prakash (retd) and Sureesh Mehta (retd). Ex-servicemen have been holding a protest at Jantar Mantar and in other parts of the country for over two months over OROP. To reduce infiltration, India will soon equip the land borders with latest integrated surveillance technology. The project “Comprehensive Integrated Border Management Solution” (CIBMS) integrates sensors, communication, infrastructure, response and command and control. Sources in the Ministry of Home Affairs (MHA) said the technology would be set up primarily at 1,500 “gaps” along the International Border (IB) with Pakistan, Bangladesh, and the India-China frontier. The project will also be eventually executed along the Myanmar border. These gaps are vulnerable areas such as riverine locations and nallahs where fencing is not possible and infiltration is easier. The technology will also cover the remaining part of the borders. 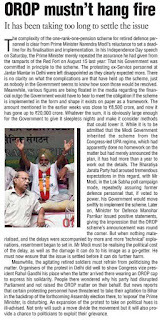 Union Home Minister Rajnath Singh has reportedly approved the project. “A tender for a pilot project for certain gaps along the borders with Pakistan and China will be floated in the next two months. 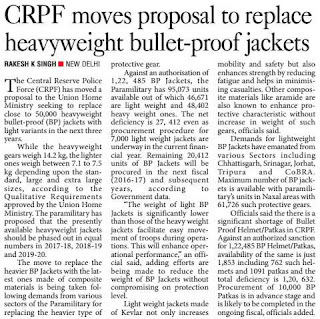 If it is successful, we will implement it on a larger scale. This project will help ground units in ensuring proper surveillance,” an official said. The MHA is currently identifying the technology that can be applied along the land borders due to the varying types of terrain that exist. 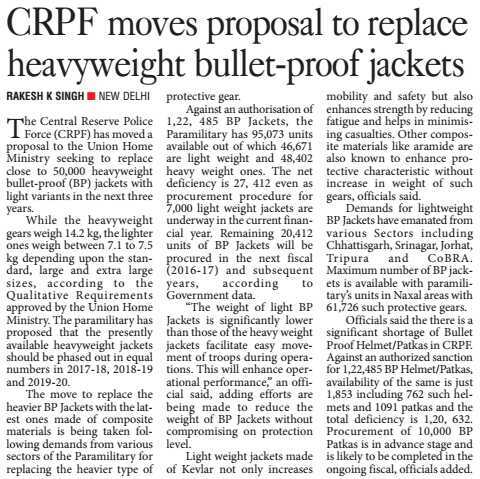 The equipment is planned to be installed in a manner that it is not affected by natural calamities such as flash floods, which may wash it away. 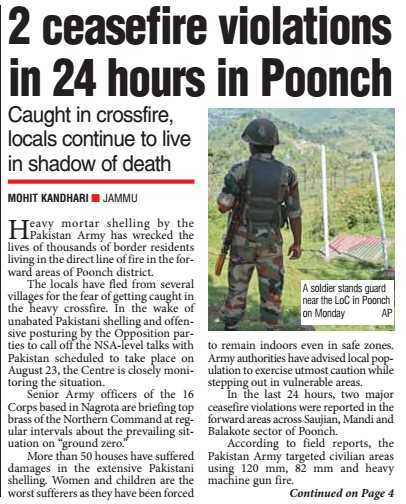 The technical solution for better border guarding gains importance in the wake of the recent terror attacks in Dinanagar of Punjab and Udhampur in Jammu and Kashmir — both towns are located near the IB with Pakistan. Explaining the functioning of the CIBMS, sources said it was an integration of humans and technology with the Command and Control centre at the heart of it. An important component of the CIBMS is the use of satellite imagery, which helps security forces to find out details of the terrain and fortifications across the border. 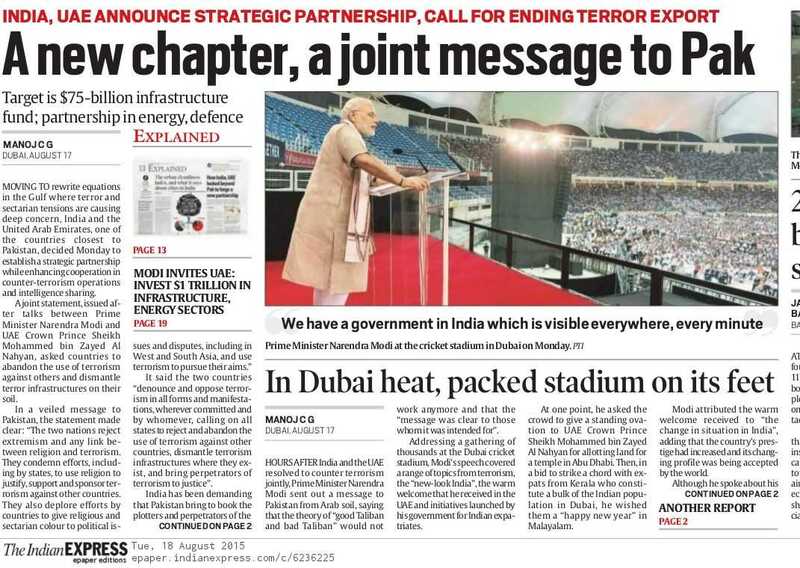 It also helps in planning operations and for infrastructure development. India’s Border Security Force (BSF) is a regular user of satellite imagery. “The Prime Minister has directed that such technology must be shared with security forces because of which officials of the Indian Space Research Organisation (ISRO) have been coming to us and we are receiving the latest satellite imagery of the areas we guard. Earlier, the process of receiving satellite imagery was slow because of its confidentiality,” a source said. The BSF has installed a 3-D based Geographic Information System (GIS), which captures, stores and displays data related to locations on the earth’s surface. 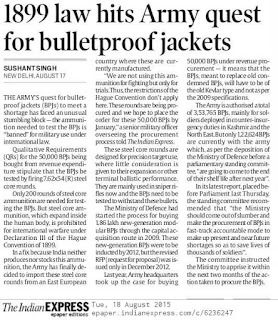 Satellite images procured by the BSF from ISRO and National Technical Research Organisation (NTRO) are installed in the system, enabling the BSF’s headquarters and ground units to view them. However, an issue with satellite imagery is that it may not provide real time information about a location, keeping in view the time taken by a satellite to orbit around the earth. Therefore, it is planned to also employ Unmanned Aerial Vehicles (UAVs). Captured Pakistan terrorist Mohammed Naved Yakub will be subjected to a polygraph test on Tuesday to nail the misleading statements he has made over the past 10 days about his Indian contacts and the route taken to infiltrate J&K. Pakistan will be able to evoke respect for its national interests only if it respects its own dignity and honour. The debacle in the west is intimately related to the disturbing developments in the east. PAKISTAN’S diplomatic initiatives with Afghanistan and India have both collapsed. Afghanistan’s President Ghani and Pakistan’s prime minister and army chief were sincere in desiring normalisation. The implicit bargain was that Pakistan would deliver the Afghan Taliban to the negotiating table while Afghanistan would act against Tehreek-i-Taliban Pakistan (TTP) leaders and militants hiding in Afghan territory. Success would have implied: Enhanced security within Pakistan from TTP-engineered terrorism and attacks by the Baloch Liberation Army (BLA), and an end to Indian pressure on Pakistan on the western front; the re-emergence of the Afghan Taliban as a political force in Kabul; and the complete withdrawal of foreign forces from Afghanistan. 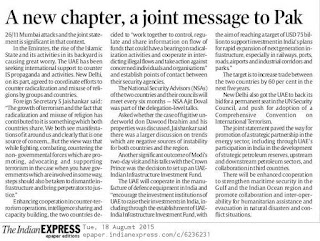 It was evident from the outset that India and hostile elements in Afghanistan would work overtime to subvert this peace initiative. They appear to have succeeded. The Islamabad-Kabul understanding was based on over-optimistic expectations on both sides. Ghani’s ability to act against the TTP and the BLA was constrained by his lack of control of the Afghan security establishment, especially the National Directorate of Security (NDS). Kabul proved unable (or unwilling) to kill, capture or expel Mullah Fazlullah and TTP elements holed up there. As no doubt anticipated by the NDS and its Indian patrons, a leadership struggle ensued between the “fight” and the “fight and talk” factions within the Taliban. To salvage the talks, Pakistan’s agencies attempted to hastily gather the Taliban leaders to select Omar’s deputy as the new Amirul Momineen, further exposing the relationship. But the Taliban’s fighting faction, freed of Mullah Omar’s ghost edicts supporting talks, and fearful of losing ground to the self-styled “Islamic State” (IS), escalated attacks against targets in Kabul. Under pressure to avoid blame for security failures in Kabul, and aware that Islamabad was unable to deliver the Taliban to the negotiating table, Ghani took the easy route and blamed Pakistan. 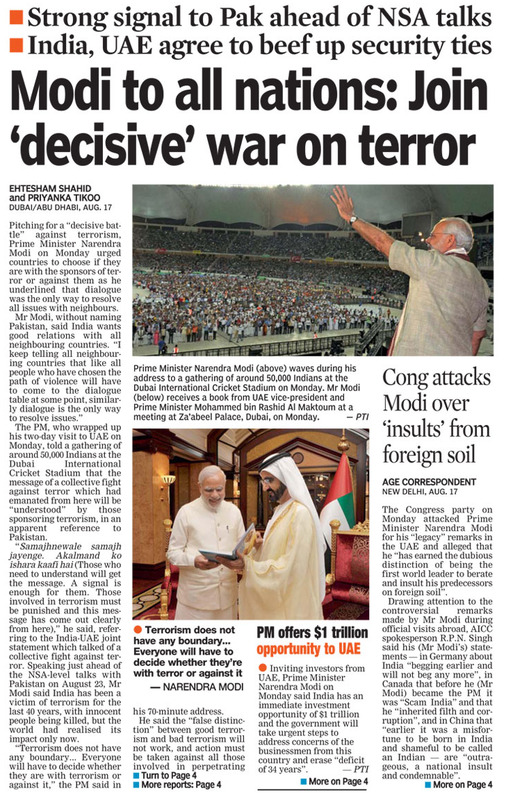 His August 10 statement was indistinguishable from Karzai’s familiar diatribes against Pakistan. Chief Executive Abdullah and other factions joined him in whipping up the anti-Pakistan animus. The “gathering” of Taliban leaders to choose Mullah Mansour as Omar’s successor was used as a basis to extrapolate that Pakistan maintained Taliban sanctuaries and bomb-making factories, and connived in Taliban attacks. Ghani declared that he did not want Pakistan to bring the Taliban to the table but to “prosecute” them. Kabul was the scene of orchestrated demonstrations against Pakistan, the burning of Pakistan’s national flag, calls for boycott of trade with and even “jihad” against Pakistan. A demand was made that an Afghan delegation be immediately received by Pakistan’s Prime Minister and army chief. Instead of protesting unsubstantiated charges and demanding an apology for the desecration of Pakistan’s national flag, Pakistan’s leadership meekly received the angry Afghan delegation to clear the “misunderstanding” ( to quote Sartaj Aziz). Pakistan should demand an apology from Kabul and a retraction of the wild accusations. If they desire a trade boycott, Pakistan should fulfil this wish until reversal of hostility. Strategically too, there is need for a policy review to deal with an Afghanistan that is likely to be embroiled in conflict for some time. Pakistan should: first, secure its border against TTP and BLA infiltration from Afghan territory; second, devise strategies to eliminate their safe havens in Afghanistan; third, promote coherence among the Afghan Taliban; and, fourth, work with China, Russia, the US, Iran and Saudi Arabia to resume Kabul-Taliban talks and insulate Afghanistan from infiltration by the IS. The debacle on the west is intimately related to the disturbing developments in the east. Apart from working to scuttle a Pakistan-Afghan rapprochement, India has rejected Pakistan’s endeavours to resume the “composite dialogue” and exerted direct pressure on Pakistan to keep it on the diplomatic and military defensive — thus the Line of Control (LoC) violations, threatening statements and the hostile media and diplomatic campaigns. 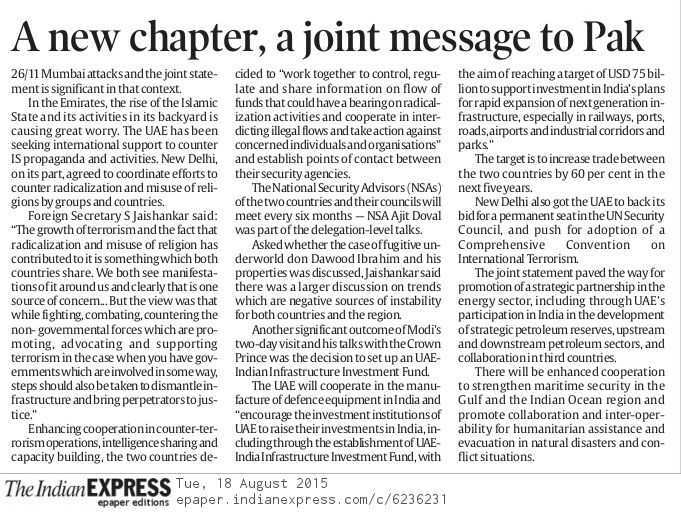 Instead of a muscular response, Pakistan has virtually endorsed the Indian premises for normalisation in the Ufa statement by restricting the Pakistan-India talks to terrorism, evoking public denunciation within the country and disappointment from Kashmiri leaders. 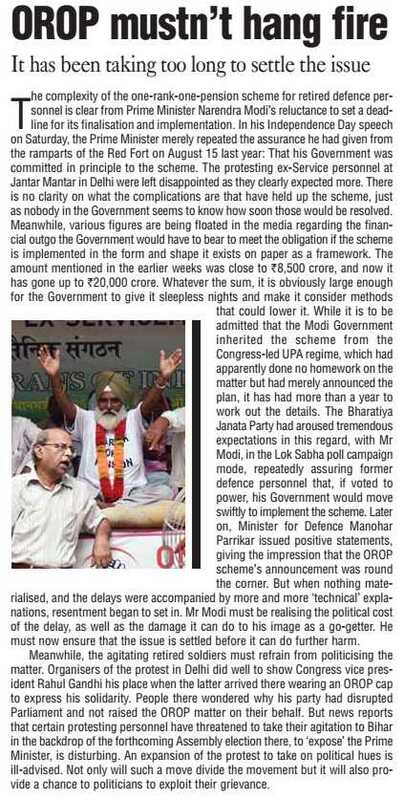 The Gurdaspur incident, on the eve of the scheduled terrorism talks, is no accident. 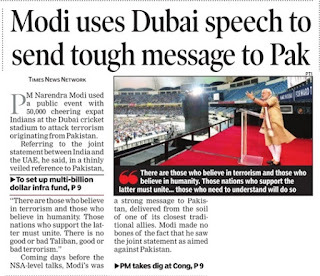 Indian agencies are pastmasters at stage-managing such events. 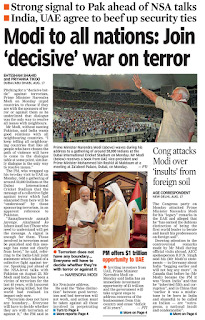 The Indian media has been unleashed to pin blame for this incident also on Pakistan. 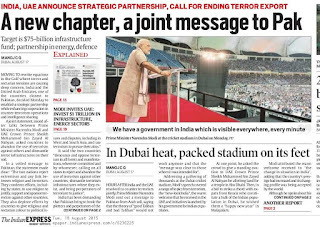 Yet, Pakistan’s national security adviser plans to walk blithely into this Indian entrapment in New Delhi next week. 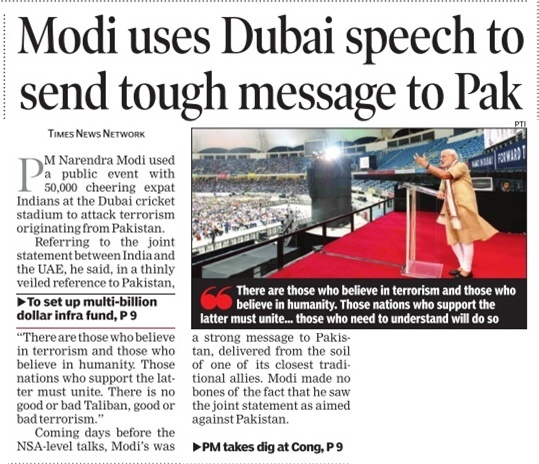 The right response would be to: call off this ill-conceived exchange; respond effectively to the Indian media onslaught by projecting India’s support for the TTP and BLA and its historic role as a state sponsor of terrorism; protest formally to the UNMOGIP and the Security Council about India’s LoC violations; and raise India’s human rights violations in occupied Kashmir at the Human Rights Council. Instead of submitting to Modi’s agenda, Pakistan should remind the world that: Kashmir remains a nuclear flashpoint and must be addressed, bilaterally or multilaterally; that India’s arms build-up will oblige Pakistan to respond appropriately; and that the danger of a disastrous conflict can be avoided only through a comprehensive dialogue encompassing Kashmir and reciprocal arms control between Pakistan and India.